Apple today announced financial results for the second fiscal quarter of 2017, which corresponds to the first calendar quarter of the year. For the quarter, Apple posted revenue of $52.9 billion and net quarterly profit of $11.0 billion, or $2.10 per diluted share, compared to revenue of $50.6 billion and net quarterly profit of $10.5 billion, or $1.90 per diluted share, in the year-ago quarter. Gross margin for the quarter was 38.9 percent compared to 39.4 percent in the year-ago quarter, with international sales accounting for 65 percent of revenue. Apple also declared an increased quarterly dividend payment of $0.63 per share, up from $0.57. The dividend is payable on May 18 to shareholders of record as of May 15. In addition to the increase in the dividend payment, Apple says it will once again expand its share repurchase authorization by an additional $50 billion and the company says it expects to spend a total $300 billion in cash under its overall capital return program by the end of March 2019. Apple sold 50.8 million iPhones during the quarter, down slightly from 51.1 million a year earlier, while Mac sales rose slightly to 4.20 million units from 4.03 million units in the year-ago quarter. iPad sales continued to decline, falling to 8.92 million from 10.25 million. Apple's guidance for the third quarter of fiscal 2017 includes expected revenue of $43.5–45.5 billion and gross margin between 37.5 and 38.5 percent. Apple will provide live streaming of its fiscal Q2 2017 financial results conference call at 2:00 PM Pacific, and MacRumors will update this story with coverage of the conference call highlights. 1:40 pm: Apple's stock is down approximately 1.5% in after-hours trading following the earnings release. 2:00 pm: Apple's post-earnings conference call with CEO Tim Cook and CFO Luca Maestri will begin shortly. 2:03 pm: Apple is providing generic opening remarks. 2:05 pm: Cook: Today, we are reporting strong March quarter results. We feel great about this performance. We were near the high end of our guidance. Larger iPhone channel inventory reduction this year compared to last year. iPhone sales were in line with our expectations. Active installed base of iPhones grew double-digits year-over-year. We gained market share in nearly every country during the quarter according to market research firm IDC. 2:05 pm: Cook: We've seen wonderful customer response to our special (PRODUCT)RED edition iPhone models. 2:06 pm: Cook: App Store revenue grew 40% year-over-year for an all-time quarterly record. 2:07 pm: Cook: Apple Pay is experiencing phenomenal traction. Now live in 15 countries. More than 20 million contactless-ready locations, including more than 4.5 million the U.S. alone. Transaction volume up 450% over last 12 months. 2:06 pm: Cook: Double-digit revenue growth from Apple Music subscriptions and iCloud storage subscriptions. 2:08 pm: Cook: Great Mac results. Revenue grew 14% for new March quarter record. Apple gained market share thanks to strong response for new MacBook Pro models. 2:09 pm: Cook: iPad results were ahead of our expectations. We believe we gained share during the March quarter in a number of major markets, including the U.S., Japan, and Australia. iPad remains the world's most popular tablet, and it's the primary computing device for millions of customers around the world. 2:10 pm: Cook: AirPods has 98% customer satisfaction rate, citing a recent Creative Strategies study. 2:10 pm: Cook: Apple Watch is the best-selling and most-loved smart watch around the world. 2:11 pm: Cook: A third of the revenue decline in China was due to foreign exchange headwinds. Apple is very enthusiastic about its opportunity in China. 2:12 pm: Cook: Apple's revenue grew by double-digits in India. A remarkable country. 2:12 pm: Cook: With the opening of our newest store in Dubai this past weekend, we now have 495 retail locations worldwide. 2:13 pm: Cook: Adding to our share repurchasing authorization and increasing our dividend for the fifth time in less than five years. 2:13 pm: Cook: Today we're also providing an update to our capital return program — increasing the program size by $50 billion, bringing the total to $300 billion. Extending the timeframe through March 2019. 2:14 pm: Cook is citing stats from Apple's latest Environmental Responsibility report. 2:14 pm: Cook: We're excited about moving into our new corporate headquarters, Apple Park. The main building is designed to house 13,000 employees under one roof, in an environment that fosters greater collaboration between our talented teams. 2:15 pm: Cook: Apple is a company that could only have been created in America […] We're incredibly proud to support over 2 million jobs in all 50 states, and we expect to create even more. 2:16 pm: Maestri: EPS was $2.10, an increase of 10% over year-ago quarter. 2:16 pm: Maestri: Gross margin was 38.9%, at the high end of our guidance. Sequential increase from 38.5% in the December quarter, particularly impressive given seasonal trends and cost pressures on certain commodities. 2:15 pm: Apple CFO Luca Maestri is reviewing Apple's financial results. 2:17 pm: Maestri: iPhone ASP was $655, up from $642 a year ago thanks to a strong mix of iPhone 7 Plus and despite unfavorable foreign exchange rates/headwinds. 2:17 pm: Maestri: Reduced iPhone channel inventory by 1.2 million units in the quarter, compared to a reduction of about 450,000 units in the year-ago quarter. So our iPhone sales were slightly better than the year-ago quarter from a sell-through point of view. 2:18 pm: Maestri: Customer interest and satisfaction with iPhone is very strong. In US, latest data from 451 Research shows 96% to 98% satisfaction rate for iPhone 7 and iPhone 7 Plus. 2:19 pm: Maestri: Quarterly increase in number of paying accounts tied to Apple services was the greatest it ever saw. 2:20 pm: Maestri: Demand for MacBook Pro was very strong. 2:20 pm: Maestri: iPad channel inventory was essentially flat. 2:21 pm: Maestri: iPad remains very successful. Recent data from NPD shows iPad had 81% share of tablets priced above $200 in US. 451 Research has 95% customer satisfaction rate for 9.7-inch iPad Pro and 100% customer satisfaction rate for 12.9-inch iPad Pro. 2:22 pm: Maestri: We set a new enterprise revenue record in March quarter, and we expect that momentum to continue through the remainder of this year. 2:23 pm: Maestri: Our retail and online stores produced great results. 18% growth overall. 2:23 pm: Maestri: We're seeing strong momentum with our enterprise partners, who are helping us deliver long-lasting innovation […] Deloitte partnership is off to a great start. 2:24 pm: Maestri: Visitors to Apple Stores were up 16% compared to the year-ago quarter. 2:24 pm: Maestri: We entered the quarter with $256.8 billion in cash and marketable securities. 2:25 pm: Maestri: We have now completed $211.2 billion of our $250 billion capital return program, including $151 billion in share repurchases. 2:25 pm: Maestri: We paid $3 billion in dividends and equivalents. We spent $4 billion on share repurchases. 2:25 pm: Maestri: We're allocating the majority of the program's expansion to our share repurchases given our confidence in our stock. 2:25 pm: Maestri: We're extending our capital return program by another four quarters. 2:26 pm: Maestri: We're raising our dividend for the fifth time in less than five years. 57 cents to 63 cents per share, an increase of 10.5%. Effective with our next dividend, payable on May 18, 2017 for shareholders of record as of May 15, 2017. Over $12 billion in annual dividend payments. We're one of the largest dividend payers in the world. 2:29 pm: Katy Huberty, Morgan Stanley: How were you able to expand gross margins sequentially and guide rather seasonally for June quarter despite what's going in memory market? Can you comment on the holdback of payments to Qualcomm, is that benefitting you on gross margins year-on-year? 2:30 pm: Maestri: Foreign exchange headwinds on sequential basis was 100 basis points, a negative. Cost pressure on memory side, particularly on NAND and DRAM. To offset that, and do better than that, we had very good cost performance on other commodities. Our services mix increasing as we go through the year is also helping given the profile of our gross margins for services. 2:31 pm: Maestri: On Qualcomm, I want to make it very, very clear that we are accruing. We didn't get any benefit in our margins in the March quarter, and we're not getting any benefit during the June quarter. 2:31 pm: Maestri: The majority of our gross margin compression between March and June quarters is related to seasonality. Cost pressures on memory will remain. We expect to offset these impacts partially by other cost efficiencies and with the improved services mix. 2:32 pm: Katy Huberty, Morgan Stanley: iPhone 7 Plus is selling incredibly well. Product was severely supply constrained in December quarter. Any lessons learned for future product launches. How would you work with the supply chain differently to better ramp these products that have difficult yields early on? Different timing of launch? 2:33 pm: Cook: One of the things we didn't get right was the mix between the iPhone 7 and iPhone 7 Plus. Demand was much stronger towards iPhone 7 Plus than we expected. Took us a little while to adjust all the way through the supply chain, to bring iPhone 7 Plus into balance, which finally occurred early in this quarter. Every time we launch something, we learn something, and we brush up our models, and apply everything we learn for next time. 2:33 pm: Shannon Cross, Cross Research: Tim, can you talk about what's going on in China? Any shifts in demand in Greater China, which was down 14%? iPhone-related? 2:34 pm: Cook: In Q2, we saw a performance that combined with Q1 of 2017 was much better than we experienced in the second half of fiscal 2016. iPhone 7 Plus, we sold the highest number of Plus models in the first half of fiscal 2017 than ever before, higher than iPhone 6 and iPhone 6s lineups. We had extremely strong services growth during the quarter in China. 2:36 pm: Cook: Our retail and online stores did well overall, and in China, where they grew by 21% in the quarter. An acceleration from what we saw in the previous quarter. Foot traffic, which is incredibly important for us given we do a lot more than just sell, was up 27% in China year-over-year. Seven of our top 10 stores in terms of foot traffic are located in China. Chinese currency devalued by 5% in quarter. Our performance continued to be weak in Hong Kong, which has been hit a bit harder as the tourist market continues to slump. Also, where the iPhone 7 Plus did well, we didn't do as well on some of the previous-generation iPhones. 2:36 pm: Cook: We did perform about where I thought we would. Not anticipating return to growth in this June quarter, but continued progress. Our business is pretty large there. 2:37 pm: Cross: What do you think about in terms of running Apple from a cash balance perspective? 2:39 pm: Maestri: We don't disclose beyond the total subscription count. There are several customers that subscribe to more than one of our services. There is some level of overlap. Total number of subscribers is very, very large, obviously less than 165 million. Very good for us to see the breadth of subscriptions that we offer and that customers are interested in. 2:39 pm: Rod Hall, JPMorgan: You mentioned 165 million subscriptions. Can you comment on the unique number of users there? Can you talk more about the average revenue for these users? 2:40 pm: Maestri: We quoted 150 million last quarter, so it's a sequential increase of 15 million subscriptions, so it gives a good sense of the momentum of our services. 15 million subscriptions in 90 days. 2:41 pm: Maestri: The number of paying accounts is growing a lot. We've added the largest number of paying accounts over the past 90 days than ever before. Large number of people coming into our ecosystem, and then starting to pay and transacting on our stores. That number is growing very, very strongly — double-digit growth. 2:42 pm: Cook: The way we think about pricing is that we come up with a price that we think is a good value for the product that we're delivering. We do that on the hardware side as well on the services side. That's how we think about it. We're really not thinking about taking profits from one category to subsidize the other or vice verse. 2:42 pm: Rod Hall: Can you comment on the usage of extra profits from the growing Services category? 2:43 pm: Steven Milunovich, UBS: Can you comment on the opportunity in wearables? Some people consider the Apple Watch disappointing. AirPods of course are doing well. Do you see AirPods expanding over time into a broader product lineup and becoming increasingly independent from the iPhone over time? 2:45 pm: Cook: We're really proud of the growth of the Apple Watch business. Revenue doubled in 6 of our top 10 markets, particularly impressive in a non-holiday quarter. Combined with revenue for AirPods, which is very much still in the ramping stage, we're not nearly close to satisfying demand, and add Beats products that our customers enjoy, that business was well into Fortune 500 status. 2:46 pm: Cook: We don't want to comment on where things are going. We do have a really great pipeline here, and I think in terms of [wearable] competition falling out, the watch area is very hard. From an engineering point of view, it's similar to a phone in terms of the intricacies […] so I'm not very surprised that some people are falling out of it. We remain committed to the business, and we believe it will become even larger over time. 2:48 pm: Toni Sacconaghi, Bernstein: Can you comment on your rationale for withholding payments to Qualcomm? What is the risk that Qualcomm could have a detrimental response such as withholding modem chip sales, or potentially getting an iPhone sales injunction in certain jurisdictions around the world? Does Apple see those as significant risks? Especially ahead of the [iPhone 8]? 2:50 pm: Cook: Anyone with a standards-essential patent has an obligation to offer it under FRAND, Fair, Reasonable, and Non-Discriminatory, terms. Qualcomm has not made such an offer to Apple. I don't believe that any is going to decide to enjoin the iPhone based on that. Plenty of case law around that subject, but we'll see. In terms of why we're withholding payments, you can't pay something when there's a dispute about how much is needed to be paid. There hasn't been a meeting of the minds there. At this point, we need the courts to decide that. Unless, of course, we are able to settle between us on some amount over time. For now, we are depending on the courts to do that for us. The reason we are pursuing this is that Qualcomm is trying to charge Apple a percentage of the total of the iPhone value, but their modems/patented technologies are one small part of the iPhone. We don't think that's right, so we're taking a principle stand on it. We strongly believe we are right, as they probably think they are. 2:52 pm: Sacconaghi: I think sequentially iPhones declined about 27% if I make the necessary adjustments. Lower than the normal seasonal drop between Q1 and Q2, which is typically closer to 20%. Is this attributable to a pause, and can you characterize how upgrade rates are doing geographically? 2:53 pm: Cook: In this quarter, we reduced channel inventory by 1.2 million units. If you look on a year-over-year basis, primarily what we look at it from a units basis, since it has seasonality embedded in that, we grew sell-through on a year-over-year basis. 2:53 pm: Cook: Last quarter was a 14-week quarter, so you have to adjust the rates last quarter to get at what the underlying sell-through growth was. So I think that when you do that, you're going to actually find that the year-over-year performance is similar between the quarters. 2:54 pm: Cook: In terms of upgraders, we saw the largest absolute upgrader rate in the first half of this fiscal year ever. Largest absolute number of switchers outside of Greater China that we've ever seen over the same time period. 2:54 pm: Cook: We had really good iPhone growth, compelled by demand for iPhone 7 Plus, which is growing incredibly fast around the world. 2:55 pm: Maestri: We don't provide guidance for this. But if you look at our history, I think it's a fair expectation for iPhone channel inventory to be reduced in this June quarter. 2:55 pm: Simona Jankowski, Goldman Sachs: 4 million channel inventory reduction in last June quarter. Just wondering what to expect for this year? 2:58 pm: Jim Suva, Citi Group: If you look at geographic information, India is under-penetrated from an Apple perspective. Do you think this next 12 to 18 months is going to be a turning point in India — working with the government to open retail stores, etc? 2:59 pm: Cook: We think India is a great opportunity. 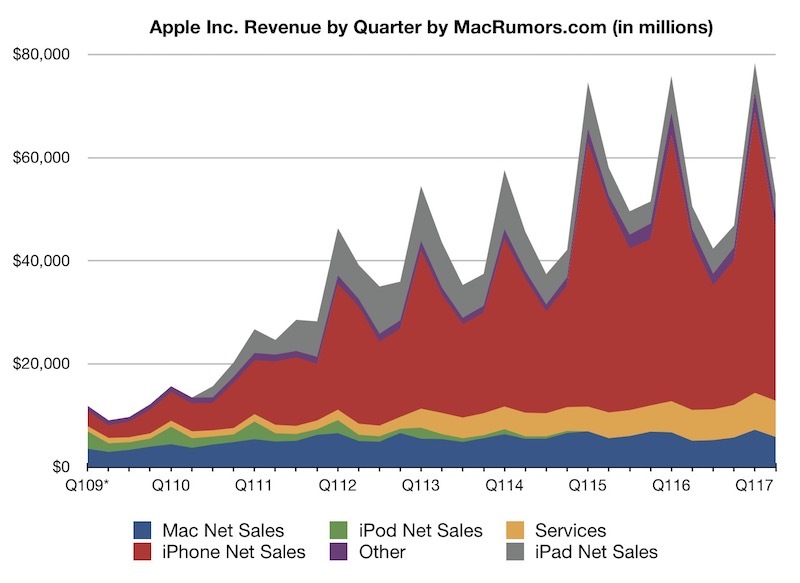 Phil Schiller was just over there opening an iOS Development Center last quarter. We agree we're under-penetrated there. Our growth rates in India are really good by most expectations, maybe not mine as much. So we're putting a lot of energy in, just like we have in other markets that have eventually wound up producing more and more. I'm very excited about it. The 4G network investment really began rolling in in a significant way towards the end of last quarter. They've been moving fast, at a speed that I haven't seen in any other country around the world, since they started. 2:59 pm: The call has concluded. Stock always dip on earnings. It's the way hedge funds and day traders like to scam the market. They scare small investors into selling and then they buy back at a lower price. Marketwatch for the last 10 minutes has been posting deliberate fake news that the stock has dropped between 1.5 to 2 percent even though it's less than 1 percent. That's how you scam the public. Scare them one day, hype the next day, scare the next, repeat. As for 'estimates'. That's another scam the investment institutions play on you. They get the original estimate from the company. Then add some more on top to make you buy more shares and pump up the price. Then when the earnings can't match the estimates that the institutions fabricated, the stock drops and the fat boys win again. Rinse and repeat because people are so dumb after decades of this scam gullible people still scratching their heads. But if you are going long long long on monopolist tech stocks you can't really lose, especially if they buy up all the competition. Just think about this for a second. 11 thousand millions. Profit. In a quarter. 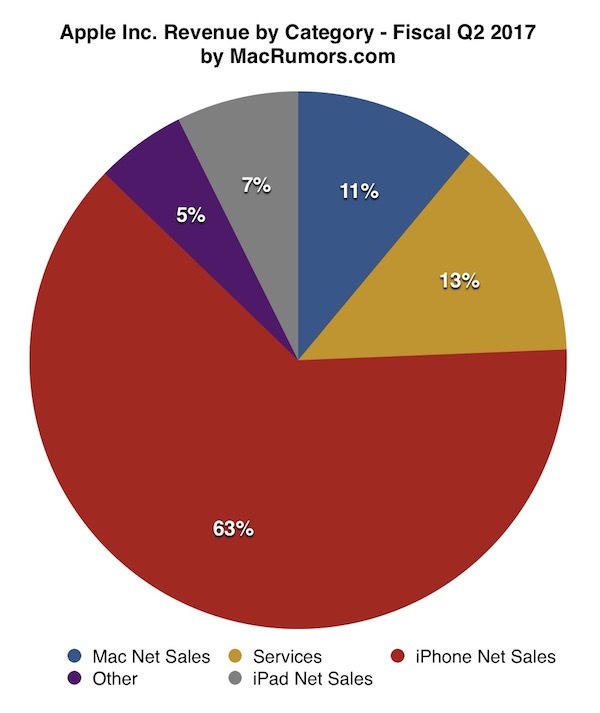 iPad sales continue to decline. SHOCKER. No updates in over a year and they re-release a 4 year old iPad with slightly faster internals. Market saturation with little to no product revolution. Odd how that works out. My takeaway is there is about 3m unit carry forward to iPhone 8 expectations and the prior high unit sales was about 78m or so (I forget). So come October we will likely see 89m units all at high margin. Buy AAPL on any pullback. Accumulate slowly and be patient.